That's the headline on the Wall Street Journal's review of the opening on June 1 in London of the English National Opera's production of The Perfect American, Philip Glass' opera based on the execrable novel about Walt Disney by Peter Stephan Jungk. I've written here about the opera, which had its first performances in Madrid in January and has already been available on streaming video. The Journal's review, which may be behind a paywall, is at this link. Heidi Waleson, in her Journal review, notes that Rudy Wurlitzer's "scathing libretto" presents Walt as "a megalomaniac: racist, antiunion and determined that only his name, rather than those of the thousands of artists who labored to bring his visions to life, will endure. He doesn't demur when an awestruck child compares him to God, and he orders his family to preserve his body by freezing after his death so that he can be resurrected." The Perfect American is, she writes, "a deeply subversive piece, whose Walt seems emblematic of many powerful contemporary figures, [but] nonetheless evokes some sympathy for its uniquely American protagonist, with his small-town roots, affection for animals and passion for trains that drove the creation of the whole Disney magic kingdom. The opera is not an anti-American screed, but rather a takedown of a ubiquitous American type." That it is also, in its depiction of Walt, almost totally false and malicious seems not to matter in the least. One might think that shortcoming was worth at least a mention in passing. Most Disney fans are not operagoers or, for that matter, playgoers (unless the play is something like The Lion King), so I'm sure it's tempting to shrug off bizarre distortions like The Perfect American and the off-Broadway play called A Public Reading of an Unproduced Screenplay About the Death of Walt Disney. But I see in them the shape of the future. What the opera and the play and their like tell us is becoming what "everybody knows" about Walt Disney, and about what a terrible man he was. You can expect much more amoral drivel like Heidi Waleson's review when The Perfect American opens in New York and Los Angeles, as I'm sure it will. From Robert Holmen: Don't worry... even when they sing opera in English no one can tell what the words are. MB replies: Not true in this case, unfortunately, according to the Journal's review: "The vocal writing is attractive without being showy. 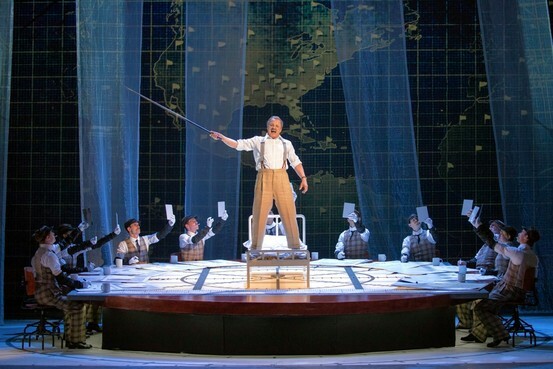 Aided by the cast's superlative diction, which is perhaps a function of the ENO's commitment to performing in English, it maximizes the intelligibility of the English-language libretto." From Kevin Hogan: I’m seeing more and more why this is a concern to you. The opera does appear to be getting more press and exposure than I may have assumed. It is rather sad that the Wall Street Journal finds the racist/egomaniac presentation of Disney to be “surprisingly sympathetic.” One would hope that a reviewer in such a noted publication would remind readers that this is not necessarily based upon fact (the article notes that it is based upon a novel only in passing), but I guess the “mean” Disney is just too juicy for the writer to pass up. From Mark Sonntag: What can I say? We live in a world that needs heroes like Walt in what seem to be its darkest days since the Depression and World War II, and yet popular culture seems obsessed with destroying them. Even recently deceased Steve Jobs isn't spared. No matter what you think of him, he did change the world—for the better? That remains to be seen. I remember thumbing through a book about Elvis Presley once, probably about twelve years ago, in which the author claimed that Elvis had sexual relations with his mom? What? We see this time and time again, George Lucas is reviled now for his prequel trilogy because it didn't meet preconceived ideas, yet the kids for whom they were intended loved them. His name is mud, yet he too, like Walt changed the entertainment landscape. It truly is a dark time, and when are they going to get it right . . . WALT WAS CREMATED. Nothing like people making money from trashing other people's successes. Entertainment? I think not. I have been immersed for the last few months in work on Funnybooks, my next book, which is taking longer to wrap up than I expected. In researching and writing it, I've been reminded repeatedly that when I’m writing a book (or anything else), it's important to ask myself first, “Am I being accurate?” Once that’s settled, my second question to myself is at least as important: “Why would anyone want to read this?” The normal reader asks that second question first, of course, and if there’s no good answer, the question of accuracy never even comes up. For Funnybooks I’ve pretty much disposed of the question of accuracy, at least to my own satisfaction, although there remain a few frustratingly sketchy areas. I’m now addressing the second question, through extensive revisions. I'm looking forward to completing those revisions soon, so that, for one thing, I can write about a number of other people's books that deserve my attention, and yours, including Thad Komorowski's Sick Little Monkeys, J.B. Kaufman's magisterial book on Snow White and the Seven Dwarfs, and Jim Korkis's latest compilations of his Web columns on Disney subjects. 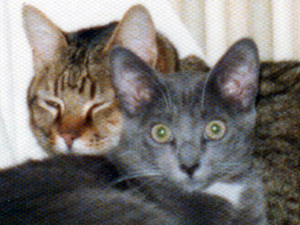 As I mentioned a few weeks ago, I've posted on amazon.com my eBook called Furr and Purr, a story for children about a couple of cats with a passing resemblance to two long-deceased members of my household. (That's them in the photo at left, which was taken in 1977.) When I wrote that book, around 1980, I put it through a long series of revisions as I tried it out on a host of adult and child friends. Everyone said they liked it, so I was taken aback by the dismissive reaction I got when I sent the book to editors and agents. They left me wondering if the book was really that bad. Last year, when I read about amazon's self-publishing program, I decided to take a look at Furr and Purr for the first time in years. Enough time had passed that I could read it almost as if it had been written by someone else. I was pleasantly surprised. It's a good little kids' book, cute and funny and suspenseful, with some charming characters. So, why was it received so poorly? Perhaps Furr and Purr is too far removed from what for the last few decades has been considered appropriate reading for children. I wrote it simply to entertain my audience, using as one model Walter R. Brooks's Freddy the Pig stories, my own favorite books when I was a child. Back when I was borrowing those books at Little Rock's wonderful old Carnegie library (destroyed decades ago in a fit of madness), the children's librarian could not quite disguise her skepticism about them, or about talking-animal fiction in general. I'm sure that bias has persisted. As with the Freddy books, there's nothing to be learned from Furr and Purr, no uplift; but, also, nothing to flatter the child reader, no insinuation that he or she must be a smart little cookie to be reading this cool book. Fun is my only aim, and maybe that's not enough. But attitudes can change. The Freddy books stubbornly refuse to stay out of print, and children keep discovering them. Furr and Purr may have a future yet. Since I first mentioned Furr and Purr here, there has been some small but gratifying feedback. No royalties yet, though! The book's future is no doubt limited in its present format; for one thing, it would benefit immensely from illustrations (the photo above is the only one, on the book's "cover"). At this point, I can't justify that expense. I can only hope that the book will eventually attract a large enough audience to make illustrations feasible. So, if you're on the fence, take the plunge! After all, it's only 99 cents (or zero, if you're an Amazon Prime member), and you can download a book onto an iPhone—and, I assume, an iPad—as well as a Kindle. You may be as pleasantly surprised as I was. From John Richardson: I really enjoyed Furr and Purr. I got my wife to buy it for her Kindle, and I finally had a chance to read it on a beach trip. Really nice, rich world you created. (I have it all in my head now.) And I truly liked the main characters—even Maurice, in a way—and the supporting cast. I was sorry for it to end. The suspenseful moments were buoyed up by the warm levity of the whole basic premise. And I’ve gotta say: it was great to read an all-out cat story, written by someone who obviously knows cats. I find it a bit irritating that most fiction authors these days seem to be writing only with sequels in mind… but in this case, I’d like to see more.